Big Day for Redemptoristine Nuns. 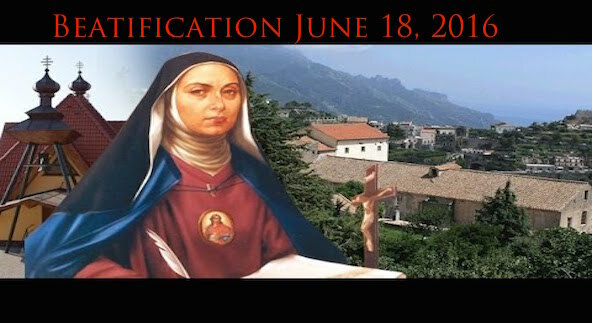 Beatification of their Foundress, June 18th. 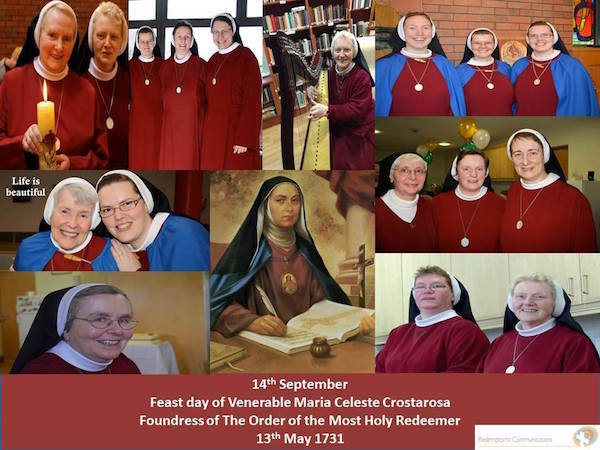 Saturday June 18th, 2016: Beatification of Venerable Maria Celeste Crostorosa, Foundress of the Redemptoristine Order, the Order of the Most Holy Redeemer. On Saturday of this weekend, Maria Crostorosa will be beatified by Cardinal Angelo Amato, in Foggia in Southern Italy. Maria Celeste Crostorosa was born in Naples in 1696, the same year as Alphonsus Maria de Liguori, who became her friend years later. Maria with the help and encouragement of Alphonsus, founded the Order of the Most Holy Redeemer in May 1731, at Scala near Amalfi in Italy. The following year, on November 9th of 1732, Alphonsus founded what was later known as the Congregation of the Most Holy Redeemer, commonly known now as Redemptorists. This too was founded in Scala. Maria Celeste, who was baptized Julia Marcella, was born in Naples, the tenth of twelve children. She was idolised by her siblings as being a lively youngster, full of life, sensitive and of good intellect. Around the age of five or six, she began to experience a great sense of intimacy with Jesus. The idea grew in her of wanting to give her life in loving and serving him as a consecrated person in religious life. With her sister, she entered a convent, but had to move on, five years later, when a local rich lady interfered too much in convent affairs. Soon after, she met up with a Mons. Thomas Falcoia, who became her spiritual director. He was also spiritual director to a young Alphonsus Liguori. At her suggestion, she joined a convent of Visitation Sisters which he was helping to reform. Maria Celeste had her own revelations from God, making her to understand God’s plans for a new institute, and she had the outline of a new rule for this institute, which would be based on the very life of Christ. In April 25, 1725, she experienced the revelation of the Lord during a time of adoration of the Blessed Sacrament, suddenly in the Host, there appeared the cross, mounted on the hill of Calvary and the instruments of the passion. * This led to the founding of our Redemptoristine Order. During meditations after Communion, Jesus revealed to Blessed Celeste about His plan in having a new institute by means of her. He ordered her to write the Rule of Life and charism to be “living memories” of Jesus Our Redeemer for this new institute, “ The Order of the Most Holy Redeemer ” . The convent adopted her ‘rule’ in April 1725. 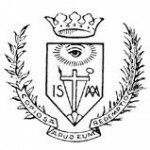 On May 13th, 1731, The Order of the Most Holy Redeemer (known today as Redemptoristines) was officially founded. The vocation of the sisters was to be a ‘living memory of Jesus’. The dark red habit , the colour of love, was to be a reminder to the world of God’s deep and limitless love for all humankind. In another vision, Maria Celeste saw the founding of a parallel min’s institute to ‘go and preach to every creature that the Kingdom of God has come upon you’. This fitted with Alphonsus’ own desire to found a congregation that would be dedicated to preaching the love of God to the poor and the most abandoned. 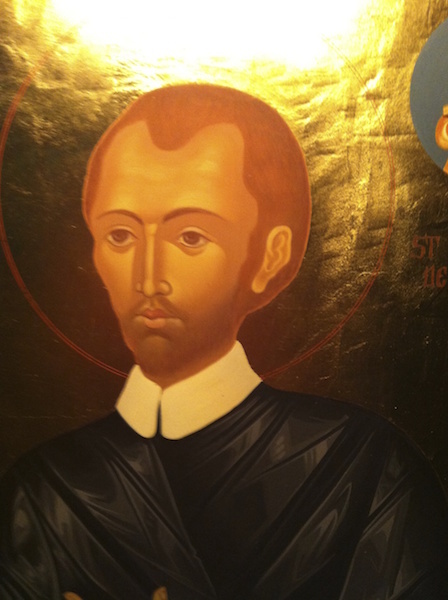 An so, in the same village of Scala, on November 9th 1732, Alphonsus and some companions began the Congregation of priests and brothers that we now know as the Redemptorists, the Congregation of the Most Holy Redeemer. Maria Celeste and her companions had to leave Scala, due to the interference of Mons. Falcoia who wanted to change the Rule and be himself in charge. After about five years, she and her companions established their own monastery in Foggia, on the east coast of Southern Italy, near the Adriatic Coast. In her life, she had many mystical experiences, but her life and rule was characterised by obedience to conscience, by constantly searching the meanings of the Gospel, and by a simplicity and joy of life. Photos of the Redemptoristine Community in Dublin. She died on the feast of the Holy Cross, September 14th, 1755. Her remains are there in the convent to this day. It is here, in Foggia, that she will be beatified on this Saturday June 18th 2016. We rejoice with our sisters, the Redemptoristine Nuns, on this very special and happy day for them and for all who share the Redemptorist/Redemptorist charism and mission. To be the ‘viva memoria Christi’, to be the ‘living memory of Christ’, is the vision of the Redemptoristines. *The Cross, mounted on the hill of Calvary, along with the instruments of the Passion, is also the symbol of the Congregation of the Most Holy Redeemer. ← Esker Novena completed! Join with Clonard, or Limerick, if you wish.